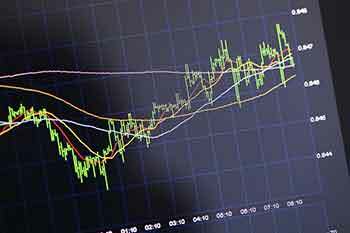 How to trade using Moving Averages? Moving Average can be defined as a tool that provides a stable observation in the price action of shares. In simpler terms, it is the average of values from the desired number of days. There once existed a time when trade was simply restricted to giving and taking of goods or services. Even though we still associate trading as giving and taking of tangible commodities, there have been too many branches that adorn this mighty tree. Shares, futures, and bonds are few of the many things that are traded in the current market. With increasing complexities, there has been an increase in various value computing and calculating methods. One such method is the calculating Moving Averages. 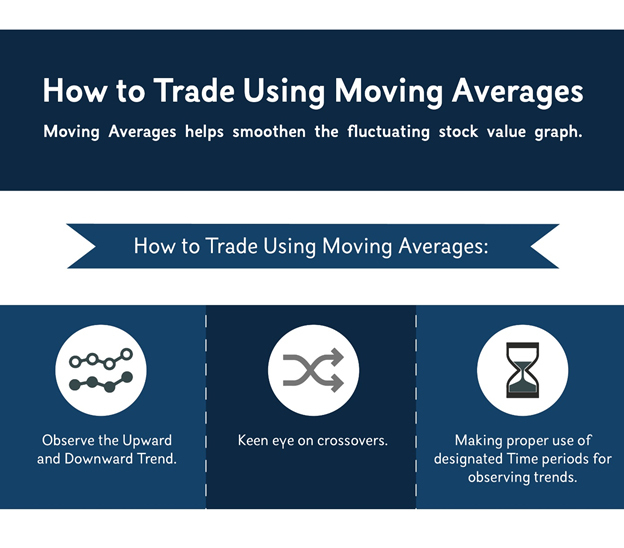 Moving Average can be defined as a tool that provides a stable observation in the price action of shares. In simpler terms, it is the average of values from the desired number of days. One important detail about Moving Averages is that it relies on the data of activities that have already occurred in the past. Thus giving them the term, Lagging Indicators. The two widely used Moving Averages are the Simple Moving Average (SMA) and the Exponential Moving Average (EMA). While an SMA utilizes the basic averaging method, EMA shifts a greater preference to the recent value of shares. When you plot a 50-day graph that indicates prices of shares during the duration, you’d notice vague fluctuations. Moving Averages cancel it out by plotting a relatively smoother graph. While observing this graph, one must look out for what kind of a trend does the Moving Average follow. An Uptrend is a situation when Moving Averages act as support for the shares prices, which bounces off upwards. Similarly, a Downtrend is a situation when Moving Average acts as resistance to the share prices. It means share prices fall downwards, below the Moving Average. Naturally, an Uptrend Moving Average is the most preferred option. The time period employed in the reading of the market trends plays a very crucial role in determining the current momentum. The momentum is favourable when shorter Moving Averages (measured within a time period of 20 days) are located above the longer Moving Averages (measured with the time period of 100 days or more). The case is vice-versa when shorter Moving Averages fall below the longer Moving Averages. Investors while observing Moving Averages keep a keen eye on crossovers as well. Crossover is the point where the share value and Moving Average intersect. It is basically the point where a possible change in trend could take place. Here, two of the most interesting crossovers are the ‘Golden Crossover’ and ‘Death Crossover’. Golden Crossover occurs when a shorter Moving Average moves above the longer Moving Average, triggering a buy signal. Death Crossover is a scenario when shorter Moving Average crosses below the longer Moving Average, which a sure sell sign. Simplification of data by Moving Averages eases the tedious process of differentiating trends. But, as is the case in everything, Moving Averages can sometimes cause false signals. This occurs especially in the case of an Exponential Moving Average that shifts its position quickly to any price change. All apart, the ability of an Moving Average to predict a possible support or resistance cannot be undermined. Its simplicity is its best tool.